Across the country, young people rally, converge and stage sit-ins to end mass criminalization—and more. Last spring, The Nation launched its biweekly student movement dispatch. As part of the StudentNation blog, each dispatch hosts first-person updates on youth organizing. For recent dispatches, check out September 15 and September 29. For an archive of earlier editions, see the New Year’s dispatch. Contact studentmovement@thenation.com with tips. Edited by James Cersonsky (@cersonsky). 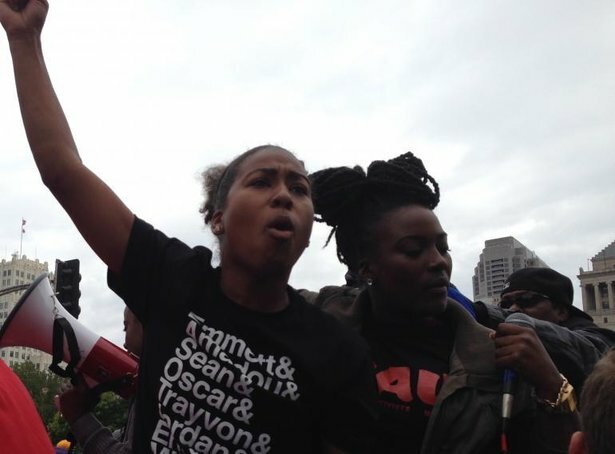 From October 10 through 13, thousands of people from across the United States gathered in Ferguson and St. Louis, Missouri, for a Weekend of Resistance that arose from protests against the murder of unarmed teenager Michael Brown, the violent police crackdown in the days following his death and the larger issue of police violence against the black community. Marches, convenings and nonviolent direct actions united a wide spectrum of causes—from labor to climate justice—as part of building a national movement against racism and police violence. At the forefront of the weekend were youth, who have led the Ferguson protests since Brown’s death in August—despite being assaulted with tear gas and arrest. Students and young people, including activists from Millennial Activists United and Lost Voices, led mass protests in both Ferguson and St. Louis in honor of Brown, Vonderrit Meyers and Kajieme Powell—two local youth killed by police—and other victims of police violence. Moving forward, we are working to build local coalitions—from student networks like St. Louis Students in Solidarity to the strengthening of relationships among young activists in St. Louis, Ferguson and other areas of St. Louis County—to build upon the momentum gained over the weekend. On October 3, as thousands prepared to head to Ferguson, students of the Community Rights Campaign in Los Angeles held a vigil, “From Ferguson to LA: Demilitarize Our Communities,” to honor the lives of the many young people who have died at the hands of law enforcement. The program that supplies military weaponry to St. Louis, the Department of Defense’s 1033, recently delivered a Mine Resistant Ambush Vehicle, sixty-six rifles and three grenade launchers to the Los Angeles School Police Department. Los Angeles schools are not a war zone. We demand an immediate return of all the weapons and a complete inventory of the weapons the LASPD has in its possession. Over the past eight years, we have fought successfully to curb truancy ticketing, ban the use of willful defiance and secure a new police protocol to decriminalize student discipline. Now, we are ready to demilitarize LAUSD and all police and build a movement for power and respect for black and brown communities. On October 5, as part of the Dignity in Schools Campaign’s Week of Action Against School Pushout, the Missouri GSA Network led a march from Normandy High School, Mike Brown’s alma mater, to the Ferguson police department, chanting, “I deserve an education, don’t set me up for incarceration!” On Wednesday, we held a speakout on experiences with school pushout and the school to prison pipeline. On Saturday, in coordination with Ferguson October, we started a chalk walk about a world without pushout and followed with a march and rally with hundreds of screenprinted shirts with messages about justice and the school to prison pipeline. Later that day, we held a trans teach-in to discuss the intersection of criminalization, race and trans identities and ended with a celebration of our ongoing organizing at the St. Louis City Museum. On October 6, Philadelphia’s School Reform Commission voted to unilaterally cancel the Philadelphia Federation of Teacher’s contract, forcing teachers to contribute to their health insurance plans—after they had already taken a two year pay freeze and have been contributing their own money to classroom supplies. Two days later, more than 300 students from Philadelphia’s Science Leadership Academy, alongside students from the High School for the Creative and Performing Arts, went on strike in solidarity with our teachers. We met at 8 am and spent the next four hours chanting and flyering to passersby to call for the reinstatement of the contract. Superintendent Hite, Governor Corbett and the SRC have been pushing a rhetoric of “shared sacrifice,” but the sacrifice is nothing close to being shared. School district staff have given $70 million in concessions this year while Harrisburg has given $12 million. This is an attack on workers, the poor, children of color and the city of Philadelphia. We stand in solidarity with our teachers and demand the SRC reinstate PFT’s old contract and continue negotiations toward a new one. After months of solitary confinement without charges at York Correctional, a women’s prison, Connecticut ward “Jane Doe,” a Latina transgender 16-year-old, has now had to endure months of further solitary confinement at CT Juvenile Training School, a facility for delinquent boys. Jane is a survivor of horrific abuses at the hands of Department of Children and Families staff and people with whom she was placed by DCF. On September 27, supporters—including the Yale Undergraduate Prison Project, the New Haven LGBTQ+ Youth Kickback, the Party for Socialism and Liberation and Black and Pink—marched to the state capitol, the most recent of several actions in Hartford. Some youth who have been through DCF have told their own stories in addition to advocating for Jane. The Justice For Jane movement is demanding the immediate removal of Jane from CJTS and her placement with a loving family, more than ten of whom have reached out with offers to adopt her. Additionally, the coalition is demanding that DCF Commissioner Joette Katz be fired, that CT statute 17a-12, which allows DCF to imprison children without charges, be overturned and that there be an independent investigation launched into DCF’s abuses. On October 14, there will be an all-day call-in to Governor Dannel Malloy’s office with demands to free Jane. On October 2, seventy students supporting Hong Kong’s Occupy Central Movement gathered at a pro-democracy rally at the University of California–Davis. We wanted to show solidarity with the protesters in Hong Kong and stage a public forum on the movement with an emphasis on the true motives of the “Umbrella Movement.” Although the movement has received significant media attention worldwide, most news reports focus on police brutality rather than on the demand of the protestors—genuine universal suffrage, a fulfillment of the Chinese government’s promises and respect for people’s basic human right of unbiased elections. While supporters in other countries cannot actively participate in the protests, we can mobilize in support of the movement. Six days after the forty-third anniversary of the Tlatelolco massacre, students across the world protested an all-too-familiar attempt by the Mexican government to silence their voices. Police were involved in the disappearance of forty-three student teachers in Iguala, allegedly handing them to the Guerreros Unidos cartel. In solidarity with the Trinational Coalition to Defend Public Education and demonstrations against the Mexican government’s history of violent reactions to student dissidence, members of the Michigan Student Power Network and MSU Students United traveled to the Mexican consulate in Detroit to deliver a letter demanding that the government return the students alive and punish those responsible for their disappearance. After reiterating the letter’s demands to the deputy consul, he attempted to shift culpability to organized crime—the seemingly preferred pretext. This answer is no longer satisfying. The Mexican people demand a government that is corruption-free, transparent, accountable and accepting of criticism; we will work to build pressure until such democracy is reached. On October 1, the 50th Anniversary of the University of California–Berkeley’s arrest of a student during the Free Speech Movement, the Cal Progressive Coalition held a sit-on at the home of Capital Projects, steps away from Sproul Hall where Mario Savio and many others answered the call to put their bodies on the gears. Our coalition formed around the anniversary to tell the story of the ongoing struggles that have made gains in spite of UC’s policy of repressing dissenting voices. The sit-in protested the privatized commercial development of UC-owned historic farmland, now slated to become a big-box, union-busting grocer. After six hours of negotiation, we won two key demands for one of our coalition members, Students for Engaged and Active Learning—a meeting with the chancellor and release of key documents—which will help them build a food initiative on all twenty acres of this historic farmland. We will continue resisting impending tuition and fee hikes, the exploitation of workers, the oligarchy of UC Regents, institutional relationships with petrochemical conglomerates, the speculative investment of tuition dollars, the arming of campus police with tactical weaponry and the installment of Janet Napolitano as UC president—struggles against privatization and violence that connect the FSM with an ongoing history of movements after 1964 tackling injustice at UC. 10. When Will Justice for John Crawford Be Served?